"Greenwashing" has been a great opportunity for artists to promote themselves in the last years. However, some artists are truly more committed than others, and really dedicate their talent and their time to the environment. Find here their charity work and causes for nature preservation. Asher Jay is a designer, artist, and Creative Conservationist. In 2012 Ms. Jay was named a USNC United Nations Women Design Star, and in 2014 she was designated an Emerging Explorer by National Geographic. In 2013 she created a large animated digital billboard for March For Elephants - the work was viewed by over 1.5 million people in New York's Times Square. Ms. Jay has contributed work to Faberge's The Big Egg Hunt with the proceeds supporting anti-poaching efforts in Africa. She also created Garbagea, an online parody project where users interact in and experience the United Flotsam of Garbagea. Leonardo DiCaprio has been a strong environmental activist for many years. The Leonardo DiCaprio Foundation started in 1998 and works in four key areas: protecting biodiversity, oceans conservation, wildlands conservation and climate change. Among others, he has criss-crossed the planet in his role as UN messenger of Peace on Climate Change. A film, executive produced by Brett Ratner and Martin Scorsese, follows that journey to find both the crisis points and the solutions to this existential threat to human species. Isaac Cordal is a Spanish street artist that creates sculptures of little men dressed in grey business suits and installs them in unusual places. 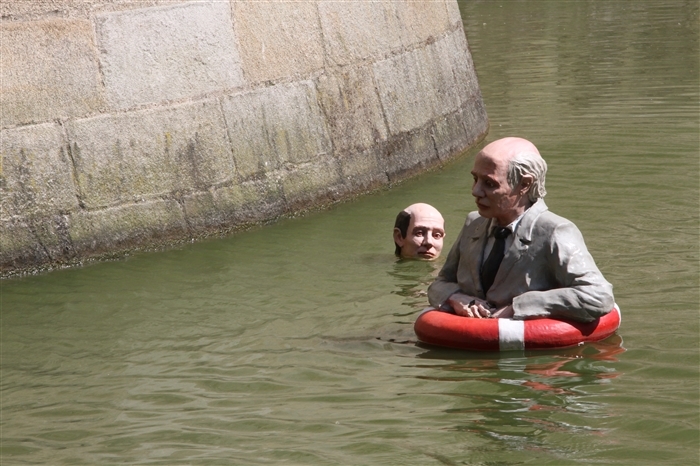 ‘Waiting for the Climate Change’ is one of his series that features 14 life-sized sculptures of these everymen submerged in water. 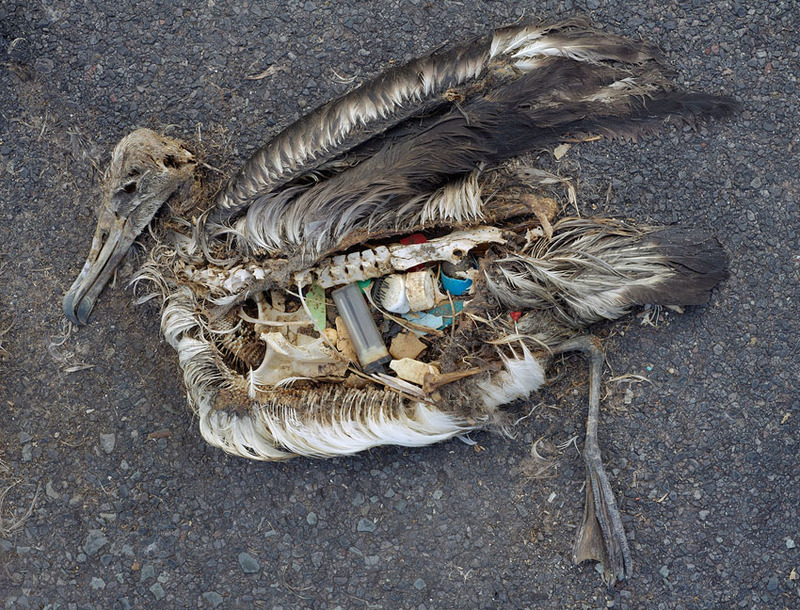 His artwork is a critique of modern society’s view regarding climate change. Frans Krajcberg (born 12 April 1921) is a Polish-born naturalized Brazilian painter, sculptor, engraver and photographer. Known for his environmental activism, Krajcberg denounces the destruction of the Brazilian forests, using materials such as burnt wood from illegal forest fires in his artworks. He will be 96 this year ! In 2016 this French wildlife painter launched in Monaco the "Delete?" project. "Delete?" is an international undertaking aiming to make society aware of the imminent threat of extinction of a large number of species. Artist Matthew Willey is the founder of The Good of the Hive Initiative, and has committed to personally paint 50,000 honeybees – the number necessary for a healthy, thriving hive – in murals around the world. Through art and imagination, The Good of the Hive raises awareness about the current struggle and population decline of honeybees while celebrating their incredible behaviors. Jordan uses everyday commonalities such as a plastic cup and defines the blind unawareness involved in American consumerism. His work, while often unsettling, is a bold message about unconscious behaviors in our everyday lives, leaving it to the viewer to draw conclusions about the inevitable consequences which will arise from our habits. This French photographer, journalist, reporter and environmentalist is especially well known for his book Earth from Above (1999) and his film Home (2009). On 22 April 2009 he was officially designated as the United Nations Environment Program Goodwill Ambassador (UNEP) and received the “Earth Champion” award for his commitment towards the environment and his work on public environmental awareness. His GoodPlanet Foundation greatest desire is to promote living together. In June 2016 he performed the track “Elegy for the Arctic” on a floating platform in the Arctic Ocean to support Greenpeace’s Save the Arctic operation. The video will be seen and shared millions of times on the internet. French artist Paulo Grangeon, together with the World Wildlife Fund, decided to create 1,600 little paper-mache pandas in Taiwan and take them on a tour through 10 major Asian cities and around the world with the aim to promote conservation of wild pandas and their habitat, as a symbol for harmonious environmental philosophy between humans and nature. The paper pandas of the exhibition are handmade from recycled paper in different sizes and displayed in landmark buildings and sites . Cate Blanchett is an activist for many environment causes. Ambassador for the Australian Conservation Foundation, she was a spokesperson with its “Who on Earth Cares” program. She also campaigned for a carbon tax aimed at big industries in Australia, encouraging them to cut back on emissions. As co-artistic director of the Sydney Theater Company, the actress was key proponents of Greening the Wharf, a project that oversaw 1,900 solar panels being installed in The Wharf Theatre at Sydney’s Walsh Bay. This now provides 70 percent of the theater’s electricity requirements and, together with a system for rainwater harvesting, will eventually turn it fully carbon neutral. Under her guidance, the theater also started reusing and recycling costumes and props. Gérard Rancinan has been a activist for many years, in many topics. His work “Et tout recommencera” is an original picture 15×9 m who has been exhibited on the main room and was presented at the 120 Presidents present for the COP21 climate conference that took place in Paris in december 2015. For the 21st climate conference in Paris that took place in december 2015, belgian artist Naziha Mestaoui projected ‘one beat one tree’ onto the city’s famed monuments. The installation bridges the virtual and reality, technology and nature, as well as what is visible and invisible. Spectators to the artwork are granted the opportunity to create a digital tree that they will be able to see growing on buildings in rhythm with their heart, via a heartbeat sensor controlled through a smartphone. the computerized tree is then actually planted in europe, latin america, africa or asia rendering ‘each citizen a co-creator of our collective future beyond individualism,’ expressed the artist.